Forget struggling with handles, cords, and other antiquated methods of controlling your awnings. Motorized coverage nets you access to reliable shelter with the push of a button. 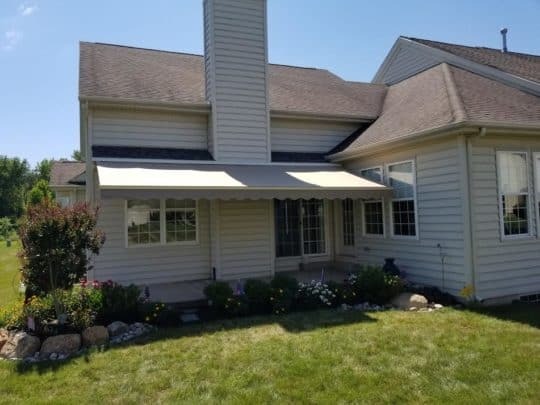 At Paul Construction, we install awnings equipped with advanced features that will allow you to enjoy the convenience of having a truly modern patio or deck area. Our electric awnings for homes will simplify your life and elevate your outdoor space. For 25 years, Paul Construction and Awning has been the preferred construction crew in the area. Our diverse team consists of both master craftsmen and certified installers. This enables us to offer a wide range of high-quality services including decks, patios, and sunrooms. To find out more about our custom hardscapes, call us today at 610-287-1623. While taking the manual approach is noble, even the steadiest hand cannot achieve a perfect fit when extending a retractable awning. Using sensors and fine-tuned motors, an electric awning will always maintain the correct tension in the canvas, eliminating wrinkles and improving the appearance of your cover. On a hot summer’s day, no one wants to sweat it out cranking a creaky handle. Switching to a motorized awning will alleviate the exertion of extending your awning, giving you unparalleled control with just a quick push of the button. An electric setup can add years to the lifespan of your awning. It does this by regulating the tension applied to the canvas. Motorization will also simplify the process of stashing away your awning under a protective hood when no one is using your deck or patio. As a result, you can prevent unnecessary damage caused by the sun, wind, sleet, snow, or rain. At Paul Construction, our electric awnings are available in countless styles, colors, and fabrics. We will install your new motorized shade solution within three weeks of your order. Besides installing awnings, we are also a full construction service specializing in outdoor hardscapes. Call 610-287-1623 today to speak with a member of our team.